"This is a thick, hearty soup. Kids love this because of the cheesy flavor." In a large stock pot add potatoes, celery, onion, chicken bouillon, water and parsley flakes. Season with salt and pepper and simmer until vegetables become tender. In a separate bowl mix flour and milk. Once it is well blended, add to soup mixture and cook until soup becomes thick. 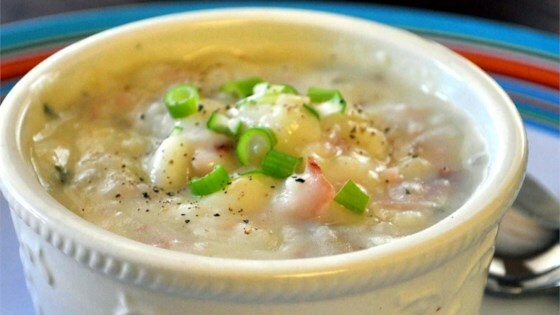 Stir in cheese, cooked ham or hamburger and simmer until cheese is melted. This was OK, but not my favorite. I have a similar potato soup recipe that uses smoked sausage and corn (no celery) along with the cheese and potatoes and we like that a whole lot more! My whole family enjoyed this recipe. I substituted frozen cubed hashbrown potatoes for the fresh potatoes to speed up preparation. We really like this soup. It was easy and fast. I like that it uses ingredients I already have on hand! Very good - even with skim milk and no ham. Would make again, but would double the recipe as it doesn't really allow for seconds.